A large LED display is clearly legible from a distance sitting next to a large control wheel. A flap on the right flips down to reveal two common interface slots. Either is suitable for inserting the Top Up TV conditional access module and viewing card. On the rear are two Scarts. 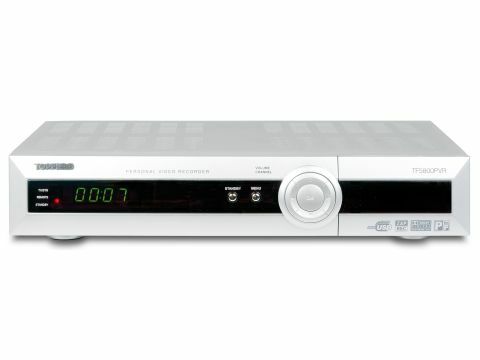 Unusually, the TV Scart offers component as well as RGB, composite and S-video support. The VCR Scart, meanwhile, delivers composite and RGB loopthrough. Also present are separate composite and S-video outputs, together with a USB 2.0 port. The latter can be used to transfer MP3 files to the hard disk or, perhaps more interestingly, the myriad of user-made software tweaks and bug fixes, (like the eagerly anticipated 'Bastille Day' update) available over the internet. Furthermore, you can transfer recordings to a PC, although, as the files are MPEG transport streams, they will require converting before burning to disc. The audio connectivity comprises an optical digital audio output and stereo phonos. The tapered remote control is rather odd-looking, but relatively comfortable to hold. It's easy to follow even if the buttons are rather on the small side. The seven-day EPG can be viewed either as a list showing a week's worth of programming for the selected channel or as a timeline grid showing what's on four channels at a time. You can use this to schedule recordings (of both TV and radio channels) and set reminders. There's also a manual timer with once, daily, weekly and weekend options. Recordings can be locked, renamed or even stored in individual folders. You can pause live TV for up to an hour and watch a recording while it's still being recorded. You can slow programmes down to 1/8 normal speed, rewind them up to 3x normal speed or fast forward up to 6x. This may seem a little slow but there's also a time bar where you can skip back and forth through a recording in chunks or choose by entering a percentage figure where you want to skip to. Fast forwarding and rewinding is relatively smoothly handled although we did experience a short (roughly one second) audio drop-out when resuming playback. Picture quality is excellent, with little blockiness in evidence on either recordings or live channels.